Help us make it SNOW in Tampa! OK, if you haven’t been following our @VisitTampaBay twitter feed you might not be aware of this awesome contest that just launched nationally with McDonalds just in time for the holiday season where fans can vote on twitter to make it SNOW in Tampa! Say whaaaaaat? Snow…. Tampa…. those two words are NEVER used in the same sentence! Here are the details folks and how we need YOUR help to WIN! To celebrate the wonder of the holiday season and the new White Chocolate Mocha, McCafe is bringing one special warm-weather spot a "winter wonderland" celebration through the Winter Wonderland Contest. 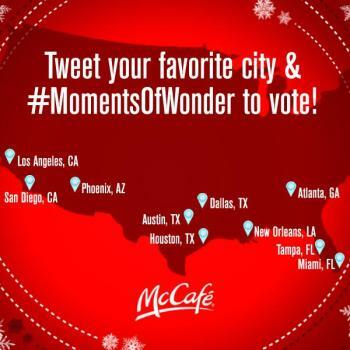 Fans can vote on Twitter using the #MomentsOfWonder and Tampa as their pick city to experience the joys of winter. There are 10 other warm cities in the running including Miami, New Orleans, LA, etc, so that&apos;s why we want to beat them out! If Tampa receives the most votes, we will WIN a winter-filled experience at a high traffic location in Tampa. The contest last until Nov. 22, so help us spread the word! Below are some example tweets, yes… we made it that EASY for you just copy and paste it in your twitter feed.